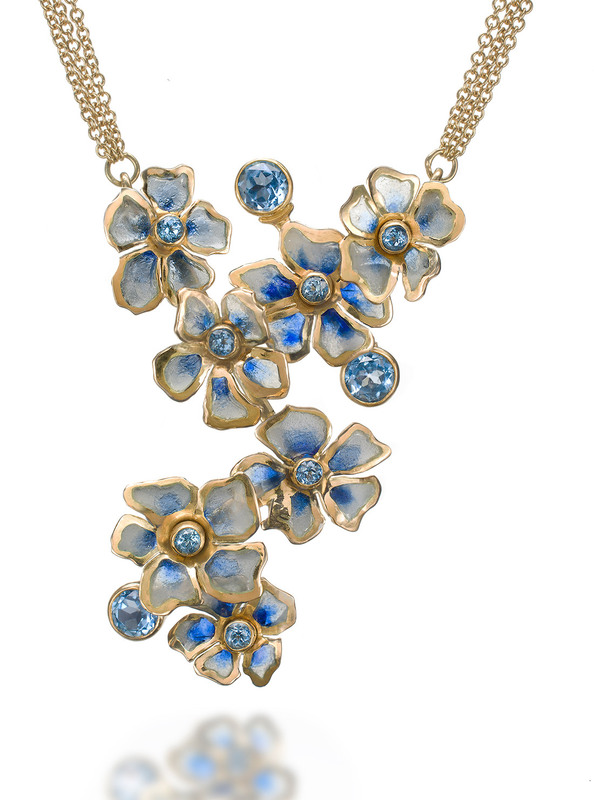 This Impatiens Enamel Necklace is a Plique-à-jour jewelry piece created by Patsy Croft. It belongs to a collection of amazing enamel jewelry with unique jewelry designs. This beautiful 18k gold enamel jewelry technique is described Plique-à-jour (French for “letting in daylight”) is a vitreous enameling technique where the enamel is applied in cells, similar to cloisonné, but with no backing in the final product, so light can shine through the transparent or translucent enamel. Plique a Jour Jewelry is in effect a miniature version of stained-glass and is considered very challenging technically: high time consumption (up to 4 months per item), with a high failure rate. The technique is similar to that of cloisonné, but without a backing. A temporary backing can be used and after firing is dissolved by acid. A different technique relies solely on surface tension, for smaller areas. In Japan the technique is known as shotai-jippo (shotai shippo), and is found from the 19th century on. As an enamel jewelry artist I created this plique a jour jewel, from impatiens growing in my garden. Visit again to see my coming creations in the beautiful enameling technique of plique a jour.